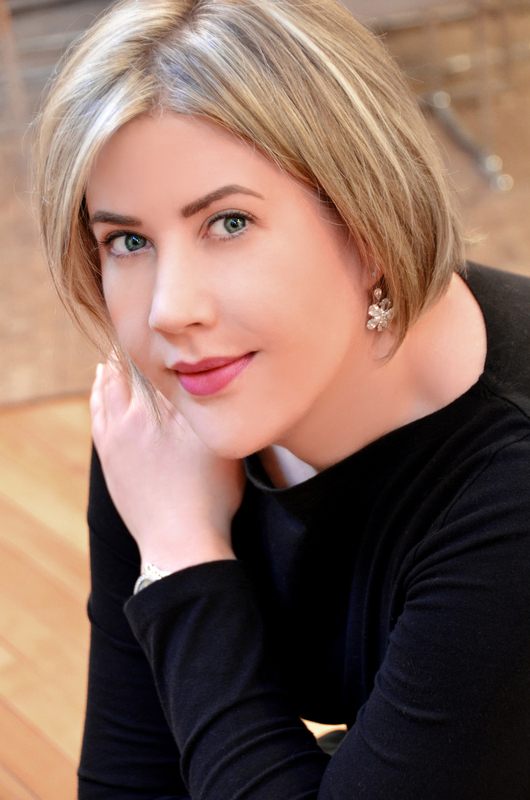 Sarah Addison Allen on writing, her childhood “dream” career & a FIRST FROST giveaway! FIRST FROST, her latest novel (out January 20th! ), picks up where GARDEN SPELLS left off. We’re back in the Waverley home, and though some time has passed and life has changed for everyone, being reunited with the characters and their stories was oh-so satisfying for this fan. Despite a lifelong love of writing, I didn’t always want to be a writer. When I was a kid, my most fervent hope was to become a trash man when I grew up. I would daydream about it. One of the main characters in First Frost, Claire Waverley, is associated with a couple of hidden “easter eggs” in the book. Although a standalone book, First Frost is a continuation of my 2007 book Garden Spells, and there are a few metafictional nods to that first book die-hard fans of Garden Spells might recognize. One hint: Claire actually describes the cover of Garden Spells when referring to something else in First Frost. A Scarlett O’Hara (Southern Comfort, cranberry juice, lime juice)— because, like Scarlett, I sometimes look at curtains and think they would make awesome dresses. But occasionally I’m a Rhett Butler (Southern Comfort, lime juice, lemon juice, Triple Sec, powdered sugar) and not give a damn. Now I want a sit down with a drink and watch Gone with the Wind. Trying to get published is sometimes a disheartening process because writing isn’t just what we do, it’s who we are. Rejection feels so personal. The best advice I can give is to just keep writing, no matter what. Don’t give up because of the dark days. Succeed in spite of them. The dark days will make the bright days seem even brighter. So bright you can hardly stand it. Maybe not one book, but one genre. I am a big fan of magical realism. And my favorites continue to be the first I ever read, in college. I think the newness, the way this literary device opened a whole new world for me when I discovered it, made these titles unforgettable, like first loves: The Passion by Jeanette Winterson, I Am One of You Forever by Fred Chapppell, Like Water for Chocolate by Laura Esquirel, A History of the World in Ten and a Half Chapters by Julian Barnes. 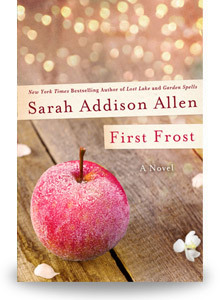 GIVEAWAY: Comment on this post by Noon (EST) on Friday, January 23rd to enter to win a copy of FIRST FROST (U.S. only). Follow The Debutante Ball on Facebook and Twitter for extra entries—just mention that you did so in your comments. We’ll choose and contact the winner on Friday. Good luck! Photo by Amber S. Wallace. SARAH ADDISON ALLEN is the New York Times bestselling author of Garden Spells, The Sugar Queen, The Girl Who Chased the Moon, The Peach Keeper, and Lost Lake. She was born and raised in Asheville, North Carolina. Visit her at www.sarahadduisonallen.com. Follow Sarah on Facebook and Twitter. I met Sarah at an event a year or so ago and discovered she has TONS of diehard fans – I’m sure they’ve all noticed those “easter eggs.” Thanks for the giveaway! This book is all over my Facebook and Goodreads feeds right now. Definitely adding it to my list. Follow on Facebook and Twitter. I’m thrilled to bits I caught this being tweeted about because I’ve meant to return to the Deb Ball since the new Debs took over! 🙂 It’s been a bit crazy busy, but I look forward getting to know each of you & your lovely stories! Today, it is awesome being able to celebrate the *First Frost! * by an author I’ve been intrigued to read and finally had a chance to soak inside a novel of courtesy of Book Browse’s First Impressions programme! I’m going to be expanding my thoughts on the novel close to the Pub date, but ooh! I personally loved the story inside this novel for the way in which the writing inside the book enchanted your imagination as you read it! Little elements of joy were sprinkled throughout the narrative, but it is the voice of the novel itself that held my interest the most! I love discovering a novel’s heart and this one had a captivating one! Ironically, I prefer “First Frost” over “Garden Spells” which I’ll talk about on my blog, but it goes to the ‘voice’ and the ‘style’ of approach of how the two stories are set apart; at least for me. I love her explanations behind why sometimes she’s more Scarlett than Rhett & vice versa! What a clever way to celebrate a mixed drink and inject it with a bobble of insight into your own personality! Loved that! 🙂 And, who doesn’t like a bit of Triple Sec? My favourite sinful cocktail is a Cosmo, yet going into it I didn’t think I was a Cosmo kind of gal — who knew my favourite ingredient is Vodka? lol I haven’t had one in years, but I liked that it was a sophisticated drink for a girl. Being that I grew up in a family whose grandfather & father liked martini’s it felt appropriate I’d like my own variation therein! I agree with Ms. Allen: as soon as I read “The Golem & the Jinni” by Helene Wecker, the genre Magical Realism had cast a permanent spell over me! We all have one novel of Magical Realism that gives us such a permanence of the genre we never quite want to step outside it! The second time I felt that rush of inertia for Magical Realism was whilst I was curled inside “Lemongrass Hope” by Amy Impellizzeri! I still think of each of these stories time to time, and have an expanding list of ‘next reads’ for Magical Realism on my “tCC” list which is my contribution to “The Classics Club”! I just might need to add-on the books Ms. Allen’s mentioned today! Wow. Love finding ‘new ones!’ to read!! Eek. Wicked joy! I wanted to say the best stories are the ones that you write out of your own heart’s intention to tell a story that is singular your own. No one can chase after anyone else’s moon because the ink is always cast against what your own pen will reveal! Own your writings and own your creativity — let it take flight and soar! As I have a copy of this novel, you do not have to include me in the bookaway. I will pick up a final copy one day, so it’s okay! I enjoyed learning about Sarah Addison Allen since I have read her captivating and unforgettable novels which transport me to another time and place. Sarah is talented and creative and this new release sounds memorable and special. I love Sarah’s books and I’m sure this one will be no exception. I follow on Facebook. Why I love Sarah Addison Allen’s novels which allow me to dream in vivid color, experience wonderful locales and enjoy stories filled with unique, and larger than life characters. Always a pleasurable and long lasting fulfilling dream come true. Thanks for this great interview. I enjoy this, and love her books to no end. I can’t wait to read this one! Following on Facebook. I look forward to reading this book. I first noticed the book when I saw the gorgeous and magical cover. Then, goodreads had a contest where I learned more about the book. Happy Pub Day! Huge fan would love to read her latest novel. First Frost sounds like a fantastic read! I love books with a southern twist! I’ve not read any of the books Sarah mentioned in her interview, but will have to check them out! I follow on facebook and twitter. I have First Frost at the top of my tbr list . Sounds like a great book! Following debutante ball on Facebook! This book is on my TBR list! I’ve read a couple of Sarah’s books and really enjoyed them. Can’t wait to read this one! I follow The Debutante Ball on FB and Twitter. I’m so happy to join the Debutante Ball! And I can’t wait to read Sarah’s new book. I’m thinking First Frost might make this chilly winter a little cozier. If there is anyone who hasn’t heard of this book, I am quite amazed! First Frost is all over the place. Thank you for this interview and giveaway. Liked on FB and foll I we’d on Twitter! Hoping I win so I can read!! So excited about this giveaway. I haven’t read garden spells but I’ve bought it to read when I get first frost. Can’t wait to start reading these books!!! I also followed on both Twitter and Facebook. This sounds like a fabulous book. It’s on my must read list. I would love to be the lucky person who wins a copy of this book. If I had the extra funds, I’d buy it. She still daydreams about how fun it would be to ride on the back of a garbage truck? To each their own…but all I can imagine about it is the stench! Especially in the summer! Liked and Followed! This book cover is so gorgeous! I cannot wait to read it! Garden Spells was my first foray into the magical realism genre and it was so interesting! A tree throwing apples?! I’d love to read the follow-up. And I follow the debutante ball on Twitter.